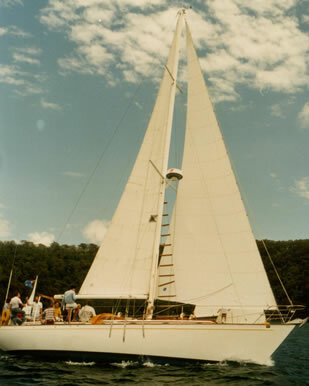 Leaving Port Moresby in Oct 1980 we set sail in a westerly direction to see if this was to be the life we wanted. We continued west for 3 years and finally arrived home in Sydney, December 1983 - very different people. It takes idyllic surroundings such as these to inspire a recap of the sailing so far. Galle has a very well protected, sixteenth century harbor surrounded by a casual assortment of wharves and warehouses (careful with the pronunciation now) that get very little use. The bay is clean with depths of around twenty feet and we are tied between mooring buoys with nine other yachts about one hundred meters from the shore. The port complex is guarded by Customs and Harbor Authority; police and Immigration Officials are all on site, so security is good and clearing in and out is an easy matter. It costs $US50 per month to stay here plus $50 for your agent whose task is to keep us yachties out of trouble. Our "agent" is the renowned Don Windsor, a Sri Lankan whose classic Dutch house lies adjacent to the port area (as do his gem shop, boarding houses and public statue of Buddha in memory of his parents). His verandah is adorned with photos and tributes from many skippers and crews who have come this way. Don offers the services yachties need: he feeds you, arranges slipping, casual labor, tours, transport, buys bulk supplies etc. etc. and is also very entertaining. Dulcinea has just been slipped ("come down from the ways" as our US compatriot would have it) and is looking very trim with sparkling topsides, new varnish etc. It is hard to resist the temptation to varnish (yet again) when good labor is available at US $2.50 per day. Total costs for three days on the slips and three hours workshop turning and fitting a new cutlass bearing, was $US62 - It's a good stopover form this viewpoint alone. We plan to leave Galle just as soon as our Norseman fittings arrive from the UK . Through that fantastic aid to good cruising, the Ham Radio, our friends on the air have organized the parts to be air-freighted to Singapore and delivered by a pilot/yachtsman from Singapore to Colombo . The fittings became necessary when the pressed (not rolled) swages began to open along the compression line due apparently to corrosion from within. I am aware of five other yachts built in the same yard who have suffered this problem so I suppose we're lucky to have got this far! More recent models, I note, now use Stay-lok fittings! All in all we are pleased with the F46 as a live-aboard cruising yacht. She is now well down at the water line and takes some trimming with spare chain/anchors, jerry cans, tinned supplies etc. to avoid a list to port. We've installed radar in Singapore with the scanner forward of the lower spreaders and are very inspired with its performance - even went in Phuket Harbor ( Thailand ) at night! Our new VHF enables us to keep close range contact with other yachts and to have interesting chats with commercial vessels. The Aries wind vane however is not a great success. I hope it will soon be operational after some modifications. If nothing else, it keeps one busy on long passages trying to adjust it. If I did have a complaint about the performance of the F46 it is the unladylike way she tends to round up when healing. Heavily laden she is probable more tender too, but it seems that the underwater shape is such that to keep her upright and moving, means frequent sail changes, particularly with the wind on the beam. We find it necessary to reef the main even at 12-15 knots - our next main will be 4 feet shorter along the boom for this reason. It is a fact that the F46 goes so well to windward, owners should consider cruising east against the trades or else buy a conventional full bodied long keeled cruiser - now I see it all! While on the subject of the next boat, I'll happily be committed in writing to the premise that a cruising yacht should regard a top class engine installation as equally important to its cruising performance. It is a fact of life that there are many days with wind of below five knots or when the extra few knots under power will get us to the anchorage before sunset or when a cold beer from the refrigerator assumes top priority. Sometimes the intrusion of a vibrating, noisy, fuel consuming engine is more that I can stand. I've replaced the shaft and countless cutlass bearings; there are three spare props in the lazarette (the results of much theory and experimentation). and our teeth still rattle! True, we can now motor at 8 knots, but what a way to go! How does an electric motor sound? To more peaceful modes of transportation: our sailing so far has been marked by memorable passages at the start and over the few days prior to reaching Galle . Looking back on our PNG experience, we now long for the clear water, safe anchorages and consistent "trade winds" weather. The passage from Port Moresby to Darwin was like that. Flat seas 15-20 knots on the beam or astern and clear skies signaled a good omen for further voyaging in these latitudes. But at Darwin we were overtaken by the wet season - and wet it was and hot, with NW winds and Cyclone Max. We remember Darwin for the good friends we made there whilst we learnt about life at the "top end". Dulcinea was moored, (courtesy of Iain and Cheryl Rae) "up the creek" ie. Sadgrove's Creek, the NE arm of the harbor. The tremendous tides used to swing us up and downstream almost touching the river banks at the turn. At high tide we were level with the mangroves and at low tide in a canyon with mud slides alive with crabs, birds and the occasional crocodile. We left our dinghy ashore at Dinah Beach (Royal Dinah Beach Yacht Club); about one mile from the mooring where enterprising Darwin yachties have formed a co-op to build their own boats or simply live out the season on the hard. A great camaraderie exists there and we enjoyed the people a lot - in any other city, such an establishment would have been moved out or taxed but that's what is different about Darwin - I'd go again any time. We couldn't wait to start sailing however, and left Darwin on 14 the April, 1981, motoring out in search of some wind whilst a solitary Carien McGuin waved us goodbye from atop the Darwin wharves, massive at low tide. Our log shows snippets of: sailing at 4 knots to a beam wind; 3 knots astern; squall; 3 knots ahead; buzzed by customs aircraft; shy spinnaker for 3 hours; saw pilot whales; motored; another aircraft at masthead; caught mackerel etc. - generally light winds from all points for 4 days until we arrived at Kupang at the Southern end of Timor. This end of Indonesia is another world; we felt like the Portuguese who first set foot here. Our first foreign port for awhile and the only Europeans to be there for months made it a unique but harrowing experience. There as in Galle a great hierarchy of government officialdom exists for the occasional ship to arrive - in Galle they actually sign on 50-100 wharfies daily in anticipation of some waterside work and officials work overtime at the Port office, but a ship is a six month rarity. When a yacht arrives at an Indonesian port, not to unload cargo but to sightsee, the whole machine sets in motion but not quite according to the conventions of normal commercial traffic regulations. Much paperwork ensues with vigorous stamping (chops), each office having a more elaborate stamp that the last. Experienced yachties we've met carry their own stamp and match each official chop with their own, with grim satisfaction. Can you picture this one-for -one war on officialdom? It is important to gain the respect of the officials, using various ploys - be well dressed with a big watch, carry Photostat copies of the sailing permit, ships papers and crew list and hand them out with reverence (to anyone who wants one). Insist on talking to the chief and compliment him on a well run office - I tell them I'm a government official from Australia - that plus having a family aboard usually turns the meeting from an official one to a social one and often results in impromptu tours in government cars, invitations home etc., instead of a display of authority, with you being put down - or out! At the outer Indonesian Islands it is "only" necessary to visit Immigration, Customs, Port Authority, Navy, Police, Health, and Maritime Police when both clearing in and out. Except at Bali such offices are usually located at extreme ends of the island which involves hiring a Bemo - a three wheeler car/scooter affair, to get about. Many short stops are therefore to be avoided since it usually takes several days to clear in and clear out! The run to Bali via Savu Island, Sumba and Rindj Islands, a distance of 600 miles was in light airs - I see an entry from James in the log . motoring, no wind, dead boring. We did enjoy a week at the uninhabited island of Rinja where we moored inside the crater of an extinct? volcano. Loads of fish, good diving, monkeys, manta rays, a whale shark and the promise of Komodo dragon and deer which kept to themselves. Bali was great - we stayed 17 days, had some carving done inside Dulcinea and made great friends of Alan and Karen Robinson living there on a United Nations National Parks and Wildlife project - what a posting. They came with us to the Kangean group of island north of Bali with their two counterpart Indonesians, a talented and attractive UN expert and a forestry official. That passage was marked at the start by a sixteen hour ordeal. North through Lombok trait, a distance of forty miles over which we averaged 7.2 knots (under 15 knots ESE + motor). It should have taken six hours but the current was ferocious, causing steep seas with overfalls and ill passengers. Luckily, conditions improved and we all spent a pleasant six days with gourmet meals and good diving before our passengers plus James disembarked at Madura. With just four of us en route to Jakarta , sailing was pleasant with a 5-10 knot easterly allowing use of our trusty old and fragile spinnaker. Traveling on moonless nights, fishing boats seemed to be everywhere, given to hurriedly lightling and waving their lanterns when several boat lengths from our bow. One yacht met later told us that when running south of Java he found three fishermen clinging to the bobstay of his clipper bow after a heart-stopping crash! We spent a week in Jakarta with friends we met during a contact over the ham radio. Paul and Christine were both generous and entertaining, giving us the ultimate treatment with all the showers and nights ashore that we needed. Refreshed, we pushed north to Singapore via the Banka Straits - light/variable weather sailing through the ITCZ with pleasant stops at several island on the way. One of these was our first 'resort island', a sort of get-away-from-it-all Hilton for the rich people of this world. There were even comfortable chairs on exclusive, swept little beaches facing the sunset from where you (they) could order a cocktail from a little man in a sarong hiding discreetly behind the coconut trees. Needless to say we observed this procedure from our mooring and kept to the tradesman's entrance on shore. The total log reading Darwin-Singapore was 2282 miles - all in light weather from March to June. The choice to go to Singapore was made in favor of the Bali Christmas Island - Cocos Keeling, Chagos and Seychelles route. This could have meant a 3-4 month wait in the Seychelles before the Red Sea passage to a still cold Mediterranean . There's nothing wrong with that of course, except that we managed to turn Singapore into a plus financially rather that spend time in the reputedly expensive Seychelles . Our budget book had already issued a warning after only six months cruising and Singapore was our chance to make amends. As a stopover, Singapore is no yachting paradise - the water is dirty, there is little or no wind and visits over two weeks are discouraged by Immigration officials. But there are plenty of yachts. The RSYC and Changi Yacht Clubs are so full they have no room for visitors, cruising yachts must anchor at Pasir Panjang- a doubtful security area (but free) on the Southern side, or at Sembawang where there are two privately owned mooring areas. We paid $50 per month for the privilege of a mooring and jetty disembarcation facility. But we were amongst friends - about thirty cruising yachts with crews both living aboard and working, or using Singapore as a base to visit SE Asia . The East and West coasts of Malaysia , Thailand , Borneo, and Philippines were on the itinerary of many of these people. Singapore is not a bad place to do repairs and improvements to the boat. There are no cheap yacht chandlers, but parts can be imported duty free and there are many small businesses doing work in teak and stainless steel at reasonable prices. On reflection though, we stayed too long and could have spent more time in Malaysia and Thailand to achieve a similar result. We left Singapore on 11 th December 1981 and headed up the Malacca Strait . The winds were N and NNE 5-10 knots with a few squalls. We made some interesting stops, particularly enjoying the old Portuguese town of Melaka and the quiet resort of Lumut. Entrance to Melaka is via a shallow bay via a channel with ten feet depth at high tide. At low tides the yacht settled into the mud, standing uprights. Fishing craft kedge their way up the channel only meters away and the air has a real harbourside aroma. It is easy to see why most yachts sail past but those that do go in find the stop well worth while. At Lumut we anchored in the beautifully protected harbor in fifteen feet with a soft mud bottom where, unhappily, our newly galvanized 45lb CQR still lies - a link in the 3/8th chain gave way during an attempt at shifting position by dragging anchor. A frustrating day spent in diving and kedging failed to locate it. However, it was Christmas and the anchor was soon forgotten. We pooled our resources with five other yachts to have a veritable feast. The Malaysian community was proud of their yacht club at Lumut; you could hire a Laser or Windsurfer or just sit under the shed at the water's edge sipping cold beer or enjoying a top class feed at giveaway prices by the Chinese cook in residence there. We found it hard to leave but the promise of even greener pasture beckoned and we sailed the gauntlet of pirate infested water to the resort island of Phuket in Thailand . A yacht we'd met in Singapore had been brutally attacked at Lankawi about sixty miles north of Penang just inside the Thai border and reports of others were hot topics on Rowdy's morning maritime mobile ham net. The pirates were Thai fishermen traveling in craft as small as a 'long tail', a canoe, twenty feet long propelled and steered with a two-stroke motor permanently coupled to a ten foot shaft and propeller mounted high on the stern - or as large as traditional Thai 40'-60' deep sea trawlers capable of ten knots. Much discussion has been given to the wisdom of carrying arms on yachts - now it was serious . what were the most sensible precautions? Normally fishermen will approach waving and ask for cigarettes; while some just stare as you go by...How do you know when to become aggressive? Most reported attacks involved a battle of maneuvering since yachts can turn more quickly, so just keep full power and go , when pirates attempt to come alongside .Others were armed with M16's and gave no quarter -. Clearly it was better to avoid the area if possible, travel in convoy and don't let anyone come alongside. Having witnessed several rescues of Vietnamese refugees and heard their stories of pirate attacks along the East Coast of Thailand and Malaysia , I felt a long way from Australia , for in these parts of SE Asia , death is a daily routine. So we traveled with another yacht and together planned our course to give the Langkawi Island group a fifty mile wide berth. Our departure from Penang on a course of 300 degrees T was timed to pass by the closest point of the islands at midnight on the first day of the 210 mile passage. The winds were good and we kept our schedule up until dusk. At night there was no moon and we were sailing at five knots with no navigation lights. At midnight our dead reckoning put us ready to change to a course of 344 degrees T. A quick check on the radar showed three small echoes. One was four miles to port and stationary, the other two were moving towards us. Our adrenalin pumped as we started the motor and closed ranks. Something was wrong with the echo to port - damm! It was Pulau Perak, a rocky outcrop which should have been ten miles to the south; we had underestimated the southerly set as we made westing to clear Lankawi. Suddenly the echo split in two and a very fast boat left the lee of the island and headed towards us. At the same time one of the other echoes materialized to our starboard - it was a fishing boat of the 10 knot variety, about 50' traveling without lights, it changed direction to run a parallel course. We had an open VHF channel between the yachts ready for action and there was no response on channel 16 - from anywhere. It seemed only minutes when suddenly a searchlight dazzled first us then our companion yacht "Whistler", then swung onto the fishing boat. For a few seconds darkness became light and the power boats manoeuvered strangely. With full power on we headed away, watching the echoes fade to the east and praying they would not return. We learnt later that the Malaysian Navy had gunboats patrolling the area and presumed it was they who we had seen chasing a "pirate". We didn't sleep much that night or the next so we were very glad to enter Patong Bay at Phuket at 0100 hours. It was in fact, 0100 hours on New Years Day and from our anchorage some 500 meters out the whole beachfront seemed to be really swinging with disco lights and loud music. Dawn cast a moderating light however and we were delighted to observe our anchor lying in crystal clear water at 20'. We were in a well protected bay surrounded by steep hills, thick with dark green vegetation, sloping down to a mile of lean wide beach with fine white sand. Along the beachfront were eating stalls, small hotels and tourist shops - all very new with polite and enthusiastic owners. We made our entrance formalities over three days as it required several trips into Phuket town - a forty minute trip up over the hill in a local 'bus'. Our first meal ashore guaranteed every other meal off the boat too. At the yachties favorite: Mr. Lik's 'restaurant', one selects fresh crayfish, prawns, fish or shellfish while Mister Lik describes in mouthwatering detail, his way of cooking - "not too hot for you". Our favorite was prawns with garlic and Thai sauce - the Tiger prawns being around 10" long and still tender! While servicing the engine at Phuket, I discovered the gearbox heat exchanger had collapsed due to insufficient vigilance in replacing the sacrificial anode. Without much hope, I trekked around town waving the broken heat exchanger at likely repair shops and trying to converse in sign language. I finally came upon an old man making brass lamps, cutting them out with tin snips and soldering with a blowtorch as he squatted on the floor of his tiny shop. "Ah!" he said in English, "from a Ford Engine eh?" I was amazed to find he could repair the old unit and build a new one all for $60! With that sort of luck and with ten days of feasting behind us we decided to go and headed off to Sabang on the 11 th January. The winds were light and from astern - we were running a course of 235 degrees south of the Nicobars to the northern most point of Sumatra, tiny Wei Island , the capital of which is the duty free port of Sabang . There we filled with diesel, generously delivered by the Harbormaster, obtained a few fresh supplies, renewed our de-ratting certificate ( Indonesia being particular about this formality) and departed for Sri Lanka after a stay of two days. It is worth recording that on our arrival at Sabang we were disturbed by a severe tug on our anchor chain - it was none other that the tame whale shark of Sabang Harbor , thirty foot long, rubbing barnacles off his back. The Sabang-Galle passage was a fast sail, the daily miles covered being 176, 198, 164,120, and 164 - an average speed of 7.27 knots over the 5.6 days made possible by NE winds aft of the beam up to 25 knots. We had to steer most of the way (stop laughing) as the sea was up a bit and the helm was too great for the autopilot and the Aries was non-cooperative. However, we caught plenty of fish and had some delicious meals when our constitutions allowed. Just prior to entering Galle harbor, Whistler caught a 100kg marlin which they landed and filleted. They have a system of packing the meat into plastic bags then freezing for later use. Dana's favorite is "sashimi" - raw slices of fish marinated in lime juice and spices, a treat which we consumed many times accompanied by numerous cold beers. A lot has happened in these last two months, the memory of some of it immensely satisfying while some incidents quickly lead to thoughts of wonderful Sydney - anywhere in fact, except in a tiny boat on an angry sea. At this point however we have a sustained feeling of relief, we have many miles behind us and we're "waiting at the gate" ready to enter the Mediterranean for a different kind of cruising and a variety of exciting new cultures. On leaving Galle , the placid Indian Ocean was kind enough to provide a light NE breeze and flat seas to the Maldives . A spinnaker run most of each day for a distance of 370 miles at an average of 4.8 knots, we lived as though at anchor, being able to play chess, build models (Matthew) and relax a little. En route we prepared our longest anchor warp - 250 feet of polypropylene and 30 feet of chain for the deep anchorages inside the atolls. It got plenty of use - to enter port it is necessary to go ashore at the capital Male an island in the main atoll where most of the people reside and also where the currents run strongest and deepest. It was like anchoring in rapids with eddies and overfalls making a crashing sound all day and night. Dropping the anchor in the 5-6 knot current was frustration itself as the rode ran over the bow and back under the stern in a wide arc to the bottom some 40 meters below. However the anchor held after two attempts and allowed us to launch the dinghy and dash to the shore which we reached via a gap in the breakwater built right on the edge of the drop-off. One minute you were in water deep blue and running swiftly, the next in 5 feet of pale green calm. Entering port here was not much fun. We had the most thorough search ever by "security" then spent a day ashore wandering from Department to Department along the sandy streets. The Maldives consist of several major atolls each enclosing hundreds of islands and smaller atolls. To our disappointment we weren't allowed to visit the uninhabited island and needed permission from the Departments of Tourism and Interior to visit either the "resort" islands or "village" islands. We met many interesting inhabitants however, including the island's two hams, one being the Cable and Wireless Manager Dave Glynn whose frustrations and responsibilities closely paralleled my own in PNG, and another being an Australian hotelier, Jim Cusak managing the "Furana" resort island. We were invited to anchor adjacent to that resort and spent a heart stopping few minutes zigzagging in through a gap in the fringing reef to a fantastically smooth, clear lagoon. Government regulations also forbid spear-fishing but we managed to catch a few lobster by hand and some reef fish by hand line for a nerve settling treat. The hotel was full of unfriendly Germans and Italians and except for the stunning Australian daughter of the owner, tennis player Ken Reid, we rejected commercialism - more neat grass bungalows, swept beaches, diving schools, mai-tais etc. and headed for the village island of Finfushi. We made another difficult entrance with the help of Lucien and Gigi and their 14 year old daughter Anik, a Swiss family who had sailed down from the Mediterranean . It was from spending a pleasant few days with them that we coined the word "terrible'" (with a French accent) to describe Egypt and the Red Sea - and now we know! Port Said , EGYPT , April 1982. This part of the story begins one or two mile out of Port Suez with an uninvited guest climbing aboard shoving his card at you. The "yacht agent" has a spy in the Port Control tower so it is usually impossible to escape the "Prince of the Red Sea ". 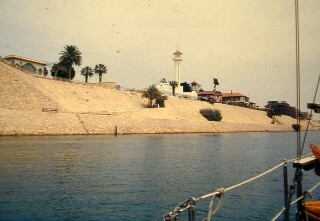 We felt understandably pleased with ourselves by arriving unmolested at the Port Suez Yacht Club around midnight after a hazardous entrance through the hundreds of moored ships, beacons and unlit piles in Suez Bay . It wasn't long after sunrise though that a minion arrived and announced that the Prince was on his way . and bringing us some flowers no less! I suppose if you're going to get separated from all you own it's better to submit gracefully, so we accepted an invitation to go to the office of the Prince. A real inner sanctum it was too, plastic wood paneled and decorated with replicas of Egypt 's treasures and photos of expensive motor cruisers. Our many fruitless visits there were always softened with cool lemon drinks and cups of Turkish coffee while he bubbled away at his hookah pipe. He managed to organize a visit to Cairo for us - pyramids and all but could not arrange Luxor which we particularly wanted to see - it being Easter. The telephone system was worse that archaic which didn't help his image as a swift organizer. Anyway, it cost us and the other yacht $200 each for the transit of the canal - you'd think that was enough, but by the time we'd had two pilots on board and satisfied the demands from pilot stations, customs, immigration etc. we were short one carton of beer, a case of 7-up, two large meals, assorted clothes, $10, and our patience. Port Said was a case of "let's get out of here! Mediterranean here we come!" As I write we have been prevented from leaving the boat by two armed guards since our visas have expired. Since it is necessary to visit the immigration and port office to clear we are in a catch 22 situation - maybe we'll be here forever! But I digress, and to make you envious I must tell you that the passage from the Maldives to Aden was like 14 of the best Saturday sails I've ever had, all rolled into one. Perfect weather blue flat seas, a warm sun, clear skies at night and the wind always favorable at NE, 5-20 knots. We steered a course of 300 degrees and keeping to the south of Socotra, on the twelfth day sighted Cape Guardafui - the horn of Africa . The wind was aft as we rounded the Cape and joined the shipping lanes to run due west down the Gulf of Aden . and many nice compliments we got over the VHF too from passing ships admiring our spinnaker. Our log has many beautiful drawings of sunsets thanks to Matthew - something I will never forget is watching the sun go down right under the bow with the boat alive, powering along under spinnaker. Navigation too was a pleasure, both because of the clear skies and stable deck and our super calculator - our HP41C. We were able to snap off the seven navigation stars for the night and have all position lines plotted in half an hour. The calculator is alpha-numeric and has many clever little navigation programmes and does not even require an almanac. Matthew and David enjoyed sharing the navigation between them and when not calculating DR or fixes, the HP was busy with games of outer space, of guessing words and numbers or predicting my bad biorhythm days! To our satisfaction we made a rendezvous with another yacht in the Gulf heading SW from Oman . We had no satnav and they did - during the "convergence" they were heard to remark "we know where we are, but do they"? Since they were an all English crew I had to say "no problem mate" - and we did it too! 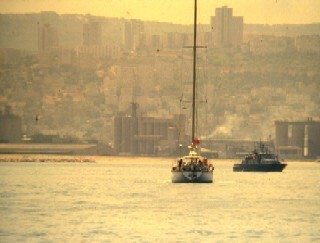 We were almost sorry to stop the journey at Aden but terrafirma beckoned and we glided into this Russian dominated port. Russians were everywhere, rude and unsmiling but our English made us popular with the taxi-drivers who remember 1965 as the day the town stopped growing (when the Brits pulled out). We met the ubiquitous Englishman outside the entrance to the port area and were invited to a film evening at the British Embassy. Tired as we were, we watched "Lawrence of Arabia" with the little group of expatriates consigned to this outpost. The town sits on black rock and sand it just looks forbidding - and the prices in the supermarkets and the market most definitely are. The bright spot of our visit was some cases of duty free Swan lager at $2 which we packed aboard and took off after a one and a half day stay. On leaving Aden the wind switched to the SE and rose in strength. As we entered the straits of Bab-al-Mandab (The Gates of Hell) at the base of the Red Sea it was blowing thirty knots which caused horrible short seas as we rounded Perim Island in pitch dark - the light on the island of course was not working. All that day we charged onwards, reefing down and down as we watched the wind speed increase to fifty -five knots. At least the wind and waves were with us - until we arrived at Zuqar Island that is! Two other yachts were waiting for us anchored in its "lee". We swung around with the wind abeam looking for the calm anchorage, but although the sea was much reduced, the wind was blowing the varnish off the two yachts "Whistler" and "Yaniska" anchored there. We started the engine then dropped sail preparatory to dropping anchor and immediately shot backwards chewing up the trailing log in the propeller! Ignoring the loud whacking noise on the hull we were able to inch forward to drop anchor - on a coral bottom. Three attempts later it held and with much warp out to soften the snatching, we retired below, rather sorry we had decided to stop. We were even more sorry a day after leaving the island! The wind had lessened to around ten knots, still from the SE and we were en route to Port Sudan . So far so good. But the log records that day as a bad one for several reasons . lost three lures, one whole line stripped off the reel and lost, then one whole spinnaker shredded. Yes our pride and joy went overboard. David unfortunately burnt his hands on the halyard as the spinnaker filled, halfway up, pulling David rapidly upwards as it gracefully settled under the bow. A father's unreasoned wrath knows no bounds! As it turned out we've had no opportunity to use it since. The wind that day suddenly dropped then swung to the North. We were able to lay our course close-hauled for twenty four hours when the wind swing to the NW dead ahead. With only sixty miles to go we valiantly tacked out from the coast of Eritrea (I hadn't heard of it before either) towards Saudi Arabia . But as the wind increased to thirty-five knots, the seas became so steep it was impossible to lay a course better than 90 degrees off the wind. We had the option of heaving-to in the shipping lanes or motoring into the sea. We chose the latter and spend an agonizing twenty-four hours motoring into the wind and sea at two knots. Navigation was difficult as several lights were out and the coastline to the SW of us was a maze of reefs. Although the sun was shining, visibility was extremely poor due to a dust haze which we experienced right up to Suez . We were very glad of our radar and were able to confirm our position from passing ships over VHF. We had to check though, that the information came from satnav, since as we discovered to our amazement, their DR position give can often be of doubtful use. We were glad enough when we confirmed our position at twenty miles east of Port Sudan and bore off at nine knots under staysail and reefed main across the seas towards shelter. Port Sudan was an interesting stop. We shared an anchorage with a dozen or so other yachts - mainly chartering from Europe who confirmed our fears that there was worse to come. The Sudanese people are tall dignified African/Arabs often wearing dishdash robes and turbans. They were very friendly and their prices were reasonable. The markets were loaded with fresh fruit and vegetables and duty free beer was available inside the port area. So we waited out the weather drinking German beer and eating Sudanese olives while we watched the camels go by. I made a visit to the local telephone Administration where I was made extremely welcome. Over many cups of sweet tea we inspected the world's longest single-hop microwave route across to Saudi and discussed the brain drain of technicians and engineers to Saudi. I was very impressed by the level of training of these people and by their ability to work long hours with relatively poor facilities. It is characteristic of the Red Sea north of Port Sudan that the NW blows like stink for three to seven days then calm weather follows for a similar period. The month of April is supposed to have the greatest number of calm days - you've just got to pick the right ones! Prudent sailors (or scared ones like us) have their charts marked with emergency anchorages and except for the Gulf of Suez (130 miles) and a 120 mile stretch to the south of Hurghada, 30 miles south of the entrance to the Gulf, there are sufficient hidey-holes for 30-40 mile hops. So after a round table conference with all the yachts going north we had as many theories as there were yachts as to when to leave Port Sudan . When the weather did ease, Dulcinea took off for Sanganeb reef, some 20 miles out. I've always liked the idea of anchoring in mid-ocean in water protected on all sides by a reef. Sanganeb however, wasn't as protected as might be, so we bashed another 20 miles to windward to Sha'ab Rumi. An enclosed reef about 600 meters by 200 meters with a depth of 10 meters, it offered a flat anchorage at the windward end plus great fishing and diving. It turned out to be the site of Jacques Cousteau's underwater dome which remained perched on the outside of the reef drop-off where he made several films feeding sharks etc. The wind howled through the rigging there for 4 days but the boat stayed still as we waited and listened to the progress of the other yachts on our radio scheds. On Saturday the 27 th April we were shocked to hear the news that one of our number from Port Sudan had gone aground at Zabargad Island some 100 miles to the north at 2.00am that morning. Suddenly, ham radio became a necessity and not just a luxury. There was no way that Dudley and Barbara Dewey could have been rescued with the speed they were without that 1000 hrs schedule on 40 meters. While I was underwater at Sha'ab Rumi, Angela on the yacht "Yaniska" was sheltering in the lee of Ras Banas, a cape we had all marked as a suitable anchorage. A new and diligent ham, Angela (HP3RB) came up on schedule to hear Dudley (HP1XUD) make his desperate call for assistance. The yacht "Hawk" had been hove to for 3 days without a fix, for like all of us, her skipper had difficulty in estimating DR due to the sea state. The presence of heavy shipping traffic made it necessary for Dudley and Barbara to keep watch and there is no doubt that by midnight on Friday, the retired couple was dead tired. At that time the wind abated enough to set sail, probably still under storm jib and mizzen, and lay a starboard tack to the west. Dudley, a retired sea captain who had been sailing Hawk for fifteen years had estimated his position to be north of the island. Both he and his wife were asleep when the yacht grounded on the shallow eastern peninsular-like tip of the most barren rocky outcrop of an island I've seen. Zabargad (or St. John's Island ) is about 60 miles SE of Port Berenice, an Egyptian Naval post about 10 miles west of Angela's anchorage. Quick action on the radio soon had 5 or 6 Israeli hams in touch with her and a telephone patch was setup through to the US Naval attaché in Tel Aviv. Angela told him the story and it wasn't long before the US Embassy and Egyptian Navy in Cairo were involved. Two aircraft were dispatched from Cairo on Sunday, they circled over the island where by that time Dudley and Barbara were sheltering on the beach. Yaniska also made her way into Port Berenice where they were met by the Egyptian Naval Commander. Later that day, a helicopter arrived from Cairo , picked up the Commander and went on to Zabargad where the hapless couple were lifted to safety and brought back to Port Berenice. After a few brief words with the crew of Yaniska they were whisked off to Cairo then home to the USA . So sudden, so final . a beautiful timber schooner built in the 1930's lovingly restored and home for 15 years, now lying on her side on the other side of the world. If only .. It was one week later when we saw the Hawk. Arriving on dusk in fairly calm conditions we gingerly made our approach hoping to anchor for the night. The Hawk was there high and dry with storm jib flying, about 50 meters over the reef - she looked to be in good condition. To my greatest regret, we could not anchor that night, there was just no anchorage and there was too great a risk in hanging off the edge of the reef plus we were anxious to make our northing while the weather lasted. The decision not to stand off and wait for the dawn was made even harder by the knowledge that the owners were not allowed to take anything with them in the helicopter. The equipment they had taken ashore was still there, under some bushes! If only . As far as we know the only yacht to examine the Hawk closely was the yacht "L'Avance" who told us later they left the boat intact as they expected the owners back at anytime - it looked to be in such good condition! Dudley insisted though that she was beyond repair, an old yacht, an experienced skipper, I suppose he would know. Very chastened, we pressed on the wind dropped and the seas flattened right out so we gambled on another two days of good weather to get us to Hurghada. Wrong again Aston! With 130 miles to go at 2000 hours on Sunday 4 th April, we observed a cloud front, stretching in a straight line from East to West heading towards us at great speed from the North. As it passed overhead, the temperature dropped and the wind swung from north to south, then back again. In 10 minutes it was all over. But another followed, then another - an eerie procession in the moonlights, each one bringing stronger winds. By 0200 hours next morning we were in 45-50 knots from the NW with seas I never hope to see again. The relatively narrow Red Sea has the knack of building up complex waveforms from reflections off its shore. In some cases wave peaks were not more than a boat-length apart and we were falling into holes every few minutes. Heaving-to just didn't seem to work. With two reefs in the main and the staysail, it was not possible to lock the helm and leave it since the motion was controlled by the waves and not the wind. I feel sure the same wind in open sea with a longer swell would have been much easier to sail or hove-to. Other yachts we spoke to on our twice daily schedule were having the same trouble. Lady Aoleus, a Vagabond 47 with ketch rig and full keel, was more to the east and seemed to be able to heave-to without losing ground. Whistler was holding position by motoring - she has a 26" prop and powerful engine, Yaniska, a cutter of 45", was further to the north in the narrowest part, the Gulf of Suez . All she could do was to trail warps and car tyres, setting sail or motoring occasionally to steer around the numerous oil rigs in the area as she ran south. She eventually lost over sixty miles of hard-earned northing before anchoring in the lee of Ras Gharib where she rolled painfully. Similarly, Coco-de-Mer, a 50' ketch found he could not hold ground east of Hurghada and turned west to close the coast for shelter. She ran down the coast for sixty miles and finally found shelter at Al Quesir. About 1500 hours that afternoon, we'd had enough. Our main had ripped along the second reefing line and we were motoring to hold our position trying to set the third reef when, shame oh shame! (Hiscock would be disgusted), our jib sheet snaked its way out through the fairlead and wound around the prop! Silence reigned as we lay rolling side-to the weather. With our minds in neutral, (to disassociate the none-to-pleasant feelings in our stomachs) we pondered our predicament. The first thought in our minds was that we'd rather be somewhere else! Eventually we fitted David with a safety harness and line and arming him with our sharpest knife, threw him overboard! It took nearly 30 minutes in the pitching sea to free that prop. David hung on to the Aries bracket with one hand and sawed away with the other, the stern lifting him clear of the water one minute then burying him the next. It was a very cold, tired and sick young man whom we proudly hauled on deck and dispatched to his bunk. Off again into an uncertain night we were amazed to hear the VHF calling "Dulcinea". It was Coco-de-Mer, "Come into Al Quesir "they said and tie up with us" . Music to our ears, we headed west for the coast, hoping for an easy landfall before dark. Our DR suggested we were 15 miles north of Al Quesir and reluctant to give up around 10 hours of northing, we sailed as high as we could, which was due west. We sighted the coast through the haze about 5 miles off and soon made out the phosphate works described in the pilot as the predominant feature of Al Quesir. That's funny - there goes my DR, but on, on. Then Coco-de-Mer announced she could see us and our course in through the outer reef was obstructed, Hallelujah! Right on dusk we tied off her stern and gratefully went aboard for a welcome meal. Together her skipper Peter and I examined the charts and were rather amused to learn from the agent that we were not in Al Quesir but at Hamraein, another phosphate works 12 miles to the north. At least it was Egypt ! The agent gave us our first taste of baksheesh, ripping us off with relish it seemed. He charged us a fortune for apparently valid customs and quarantine receipts which we later found to be worthless. He sold us some fuel at twice normal price, leaving it in drums on the shore. Most of the following day was spent carefully winching the two yachts as close as we dared to the shore and siphoning fuel aboard. This new location was more comfortable however, being in the lee of two large Arab dhows also sheltering there, so we stayed for two days watching the dust and phosphate build up on the rigging. It got everywhere; it even made your mouth gritty! On shore, the local pilot not being a busy man was given to sitting on a bollard making observations about the weather. After a while we listened to him, since each prediction seemed to come true. "Tonight it will blow hard form midnight to 8 o'clock in the morning" he'd say. "Next night it will ease earlier before dawn, then the next day you will leave"! Sure enough on the third day the two dhows prepared for sea so we followed them out into what turned out to be 5 days of calm weather. I have little to report on the last few hundred miles from Hamraein through the Gulf of Suez except that we motored as fast as we dared, zigzagging amongst the oil rigs, supply ships and commercial shipping dead set on getting safely to Port Suez - which I'm glad to report, we did. Life is now peaceful and the relatively languid waters of the Med. Beckon. If we ever get out of here we have an appointment with an Israeli family at Haifa 170 miles NE of here.